Marketers wouldn’t dream of spending budget on banner or PPC ads without a measured and positive return on their investment; but for some reason, many of us still play dumb when it comes to the hard data about the performance of our social media marketing investments. And even if you’re not spending budget on Facebook or Twitter, remember: Time is money, and you’re probably spending a significant amount of time. All too often, social media marketing advice comes from greasy, snake oil hucksters selling platitudes like “engage in the conversation,” or worse, “be awesome.” While advice like this is hard to disagree with, it’s not useful or concrete. Instead, we marketers should be measuring our social media marketing campaigns to determine what is making our businesses money -- and what isn’t. In other words, ignore the unicorns-and-rainbows superstitions. A while ago, in a HubSpot marketing team meeting, we were discussing how much we should be willing to invest to gain a new social media follower or Like, and I found myself at the whiteboard plotting out a formula. Over the course of the next few weeks -- with the help of several of my geeky colleagues -- I put together a formula to calculate a metric I call VOAL (Value Of A Like). Once you know your VOAL, you can plan your social media efforts with confidence they’ll generate a positive ROI. The total number of audience members connected to your social media account. On Facebook, these are Likes of your page, and on Twitter, these are followers. The average number of times you’re posting links, and potentially converting links driven from your social media account. On Facebook, this is the number of posts you’re making, per day, that lead to a page on your website. On Twitter, this is the number of times, per day, you’re tweeting these kinds of links. The average number of clicks on the links to your site you’re posting on your social media accounts. The average conversion rate of your website, from visit to sale or visit to lead. This can be an overall average, but for increased accuracy, use the conversion rate measured from traffic coming from the social network you’re calculating. The average value of each “conversion.” In this context, a “conversion” is the action you’ve used to measure CR for. It could be average sale price or average lead value. For increased accuracy, use the average conversion value of traffic coming from the specific social network. In my efforts to make sure all social media marketers can apply this formula, I built a free, easy-to-use little calculator at ValueOfALike.com. Answer six simple questions about your business' use of Facebook or Twitter and it will tell you exactly -- in concrete dollars and cents -- what each Like or follower is worth to your company. 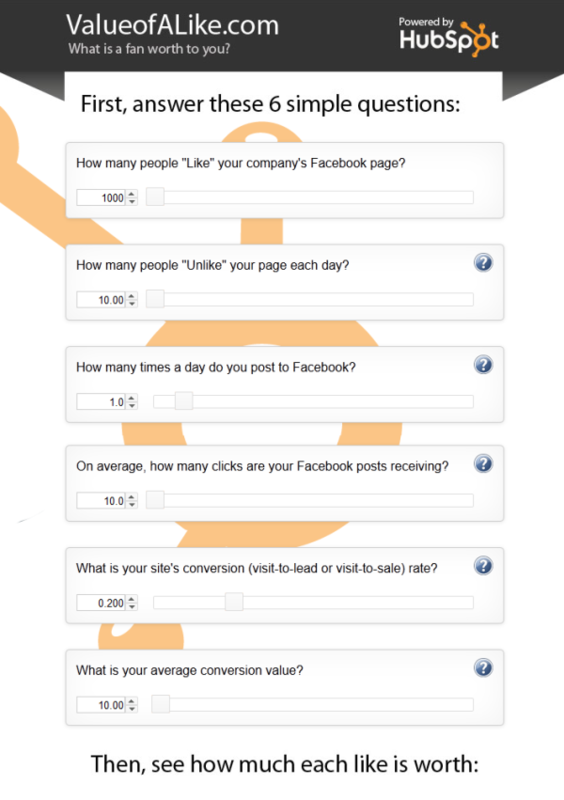 To calculate your value of a Facebook Like, you can easily answer these questions using your Facebook Insights and your closed-loop marketing analytics (in the calculator, click the question mark next to each question for an explanation about how to acquire each data point). For Twitter, you can use tools like Twitter's advertising analytics platform, closed-loop marketing analytics, as well as educated estimates to determine your Twitter numbers. Furthermore, each question input in the calculator is shown on a slider, so you can easily adjust the values up or down to see how changing various metrics will impact your bottom line. You can answer the questions for either your Twitter or Facebook marketing efforts, and you can enter information based on lead generation or actual sales data. The calculator is flexible, and it's designed to help you put the VOAL formula to work for your brand in the way that makes the most sense for you. To demonstrate what the VOAL calculation would look like using realistic numbers, let’s start with an example from Facebook. HubSpot partner Kuno Creative's Facebook Page has 3,103 total Likes, 30 unlikes per month, posts 1.3 posts per day, with each post getting an average of 190 clicks. Their visit-to-lead conversion rate for Facebook traffic is around 2%, and they report an average conversion value of $350 per lead. Because of their very high clickthrough rate of 6.12% and their huge $350 lead value, they have a VOAL of $1,729. On the other hand, if we look at some numbers from a different company -- Lynton Web, another HubSpot partner -- we see a different picture. They have a smaller Facebook presence with 174 total Likes, about 1 unlike per month, post 1.5 posts per day, get a single click on each link on average, and they told me their visit-to-lead conversion rate is around .8%. If we assume they have a $100 value per lead generated, they have a VOAL of $0.013. 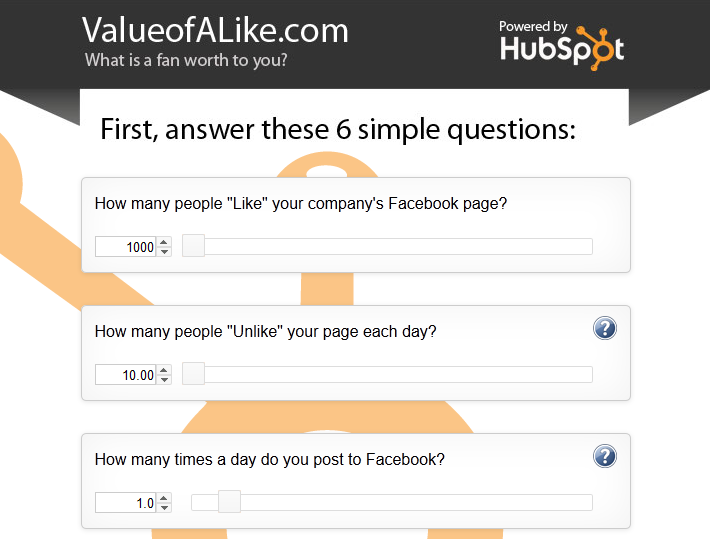 To demonstrate how we can apply the same VOAL math to Twitter, let’s use HubSpot’s Twitter metrics as an example. Here, I’ll be estimating the numbers. We have 258,522 followers and about 2,000 unfollows per month (as reported by Twitter’s advertising analytics platform). We post around once per hour -- so 24 posts per day -- and each tweet generates around 120 clicks. We have a visit-to-lead conversion rate of 55%, and let’s assume a value per lead of $40. This gives us a VOAL for Twitter of $0.32. Once you understand the true, monetary value of each of your business' social media connections, you can start to understand exactly how much time and money is worth spending to grow your social media reach, and you'll know which metrics you need to improve to get the most out of your efforts. Check out the free calculator at ValueOfALike.com. What's your business' VOAL? What can you do to increase this value?